Naturally all my work is fully guaranteed and I can cure a Denton wasps nest problem for a set fee of £35. Why wait for a pest control technician who promises to solve your Denton wasps nest problem in a day or so, when I can have the job done before most companies even reply to your enquiry. I have over 26 years experience with all aspects of Tameside pest control and of course Denton wasps nest and Stalybridge wasps nest eradication. A lot of companies claim to be local but in fact sub contract out their work, which is the reason many cannot offer a prompt service. My service is almost immediate and your Denton wasps nest problem will be solved within an hour or so. Don’t forget it is always advisable to employ the services of a professional with any wasps nest problem or pest control problem. If you have a Denton wasps nest problem, please do not be tempted to try and solve it yourself. Wasps can be extremely aggressive in defence of their nests and many people have died as a result of wasp stings. It is not important to remove a wasps nest, the main objective is to kill the wasps in the nest. This is done by the use of insecticide directed into the entry point of the nest. This also kills the returning worker wasps who will take the insecticide into the nest with them and contaminate the rest of the colony. The entire colony will die within a couple of hours. The nest will eventually just crumble away. 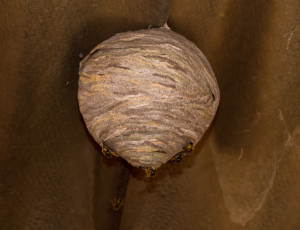 A wasps nest can contain up to 30,000 wasps, so if you have a problem with a Denton wasps nest or a Stalybridge wasps nest give me a call on 07940 062670 and I can provide a fast solution. I also provide wasps nest control and other pest control services in the Ashton-under-Lyne, Audenshaw, Denton, Droylsden, Dukinfield, Hyde, Longdendale, Mossley and Stalybridge areas of Tameside as well as Glossop and Saddleworth. All my work is fully guaranteed and I can cure an Ashton-under-Lyne wasps nest problem for a set fee of £35. There is no waiting for a pest control technician to arrive in the next day or so, like many other companies who claim to be local but in fact sub contract out their work. My service is almost immediate and your wasps nest problem will be solved within an hour or so. It is always advisable to employ the services of a professional with any wasps nest problem. If you have an Ashton-under-Lyne wasps nest problem please do not be tempted to try and solve it yourself. Wasps can be extremely aggressive in defence of their nests and people receiving many stings have died as a result. 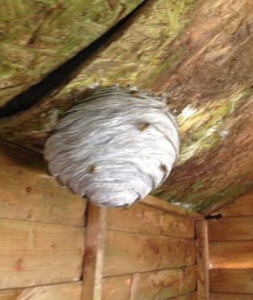 It is common for people who have a wasps nest problem to ask me to remove the nest. This is not important, the main objective is to kill the wasps, which is done by the use of insecticide directed into the entry point of the nest. The returning workers will take the insecticide into the nest with them and contaminate the colony. It then only takes the entire colony a couple of hours to die. So removing the nest isn’t advisable as the wasps would not come into contact with the insecticide. The nest is only paper or wood from the bark of trees anyway and will eventually just crumble away. If you notice wasps hovering around facia, soffit boards or air vents, then it is highly likely they are waiting to gain entry to the nest. In fact it is a good idea to inspect your property for signs of wasp activity. The best time is a hot sunny day in the middle of summer. At the end of summer there can be up to 30,000 wasps in the nest, which is why if you have a problem with an Ashton-under-Lyne wasps nest you should give me a call on 07940 062670 so I can provide a quick solution. I also provide wasps nest control and other pest control services in the Audenshaw, Denton, Droylsden, Dukinfield, Hyde, Longdendale, Mossley and Stalybridge areas of Tameside as well as Glossop and Saddleworth.